Crafting with a toddler is one of the hardest things I think I've done! To be fair on him Thomas is only 15 months but he does a lot of art and craft activities at nursery and so is very used to paints and crayons etc, he gets so excited when I get any of the 'art' supplies out. 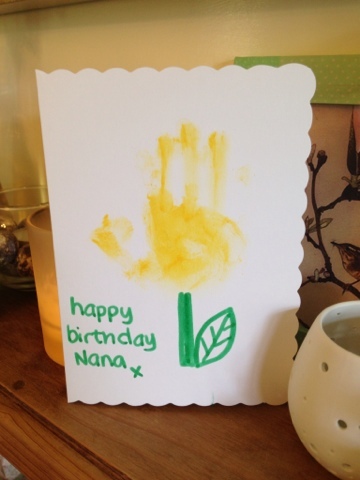 I wanted to create a tulip handprint card for my Mum's birthday, the first obstacle was trying to get him to just do one handprint per card when he wanted to put handprints everywhere, including on the wipeable tablecloth. My second challenge was to try and get him to hold his thumb in to from more of a 'tulip' shape, that way we could do a spread hand flower in a different colour for other people or events! We ended up with a good attempt but I think he enjoyed scribbling writing inside himself more! Next time I'm just going to give him creative licence and then turn it into 'something' afterwards. Having a baby is certainly testing my control freak tendencies!!!!! Happy Friday, have a lovely weekend filled with lots of good food & wine, friends, family and love.